The most effective language learning app for busy people. Learn Spanish, French, German or Russian more quickly. Lingvist uses machine learning to adapt to you based on what you know, to level-up your language learning power with trackable progress. Try it now to boost your language learning power! PRACTICAL Our method is based on the vocabulary most often used in everyday conversations or business situations, with courses built from sentences and phrases found in the real world. INTELLIGENT Our smart algorithm tracks your progress and decides what you should learn next to make the most of your time spent learning. PERSONALIZED The program measures your memory and adapts the learning experience to match your level and capabilities, all in real time. 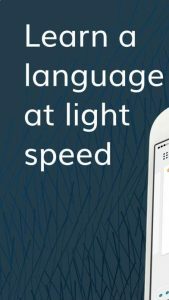 FAST The science behind Lingvist helps you achieve your language learning goals in the shortest possible time. Download the app and expand your language skills!